We are a couple who have purchased this apartment for personal and family use. The natural surroundings that we can enjoy the balcony and the proximity to the beach. A few meters away we have access to restaurants, shops and supermarket. Allows you to travel without driving in the car! We had a great stay at Benigno's apartment and our kids loved the pools and the close access to the beach. We walked to the shops and restaurants and used our car to drive to Albufeira and other local beaches which was great. The apartment is very comfortable and airconditioning worked really well. While some things are a little dated, it is great value for money and we would definitely return. Thankyou also for being very proactive when there was an issue with the keys. 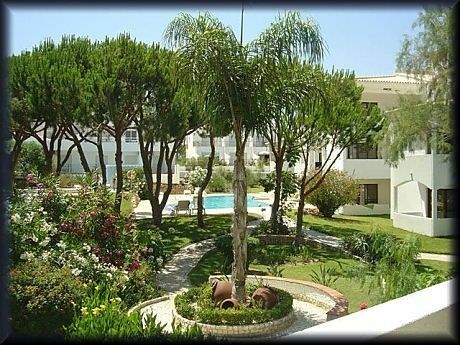 Apartment bright and set within lovely grounds. Location very convenient. stocked. Apartment approximately 10 minutes walk to the beautiful long beach. Will certainly return when coming to Portugal. Fico muito satisfeito que tenham gostado do local e do apartamento. Espero voltar a recebe-los em uma próxima oportunidade e em melhores condições pois o apartamento vai sofrer algumas remodelações para ficar mais confortável. Appartement spacieux très bien équipé, piscine sécurisée et agréable au milieu d un magnifique jardin, le propriétaire donne toutes les indications nécessaires à l arrivée et au départ. De plus la plage des falaises à 5 min est magnifique. As tarifas anunciadas referem-se a uma ocupação base até 4 pessoas. The advertised rates refer to a basic occupancy up to 4 people.